This incoming A-Class range may well be the shot in the arm required to garner youthful attention. WANTED: Drivers seeking fun, style and prestige. Traditional Mercedes-Benz buyers need not apply. The three-pointed star is slowly breaking the mould. Starting with the C-Class Avantgarde line-up several years back, Mercedes-Benz is gunning for a younger audience. And the flagship A 250 Sport has the ability to attract a new breed of Benz buyer - younger, and the young at heart. While the A-Class range goes on sale from March 1, we were given a quick spin of the range-topper which has accounted for half of all pre-orders of the compact hatch. Most Mercedes-Benz drivers tend to purse the lips when driving. You can't help but smile in the A 250 Sport. The predominantly black colour scheme has been maintained but this sporty derivative has style and personality. A carbon-fibre look dash is soft to touch, while the chrome turbine-looking air vents are complemented by red surrounds. The red highlights continue with the seat stitching, seatbelts (you can get them in black if it's all too much bling for your liking), as well as outside on the body kit aprons and brake callipers. One bugbear is the large colour screen, which juts out from the dash and can't be folded away. While figure-hugging the sports seats don't lock you into place and offer support in the right spots. Head and leg room is particularly good up front where there is electronic seat adjustment. Things are pretty tight in the back, where leg and knee space is confined and dependent on the generosity of those sitting up front. Children may find the high waist line impedes their vision as the rear window side is small. Near faultless through twisty and challenging terrain, the A 250 Sport never put a foot wrong. Despite being front-wheel drive, there is no hint of torque steer nor does the hatch push into typical oversteer at speed or during hard cornering. It has tenacious grip and beautifully direct steering capabilities. The 2.0-litre turbocharged petrol engine is a cracker, smooth in its power delivery that can hammer from standstill to 100kmh in just over six seconds. The four-potter donk is partnered to a seven-speed automatic gearbox and the pairing work seamlessly together. The self shifter is intuitive, meaning you rarely need to make use of the paddle shifters on the steering wheel, and it will rev right up to the redline. Benz's performance division AMG bolstered the A 250 with a sportier suspension set-up, along with a thinker anti-roll bar, sports exhaust, optimised brake cooling and a more direct steering ratio. Three dive modes are available, economy, sport and manual. Economy is best in most conditions, but it's sport which offers the most fun and immediate throttle response. All new A-Classes have auto stop-start, alloys, reversing camera, an automated parking system, parking sensors, radar cruise control, Bluetooth with audio streaming crash warning functionality, 14.7cm colour display and sports seats. Being the range-topper, the A 250 Sport also gets 18-inch five-spoke AMG alloys, full body kit, panoramic sunroof, sports suspension and performance-focussed powerplant tuning, sports seats in man-made leather and flat-bottom steering wheel. 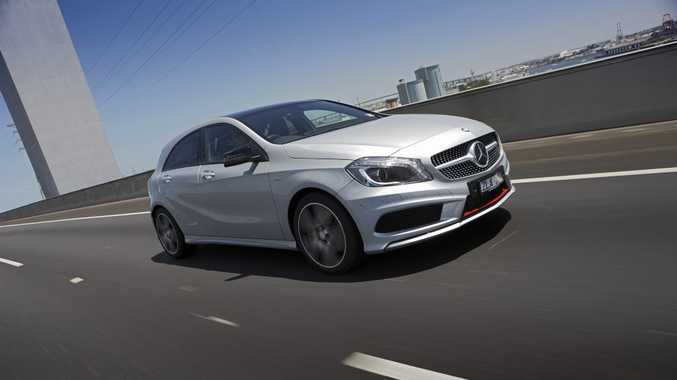 The Mercedes-Benz A 250 Sport. 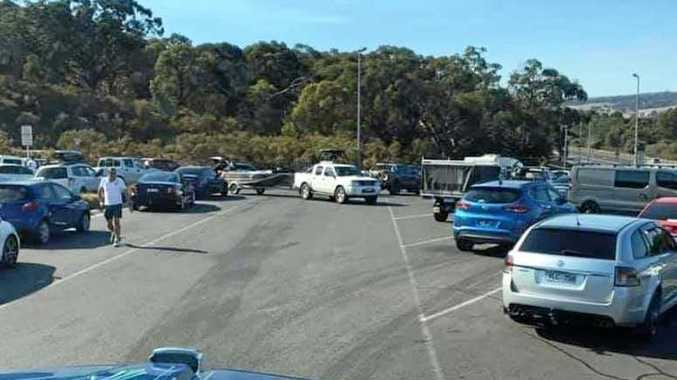 This is really a hot hatch for all ages, but competitors include the VW Golf GTI (from $40,490), Ford Focus ST ($38,290), Renault Megane RS265 Trophy ($51,640) and even the BMW 135i M Sport ($75,100). Official fuel consumption figures from Benz rate the A 250 at a thrifty 6.6 litres/100km of premium unleaded, but a hard drive saw it up above 10. Insurance may be an issue for some drivers due to the prestige brand and turbocharging. The luxury carmaker is investigating servicing options, but as yet there is no plan for capped servicing. Five can be accommodated, but the back seat space is confined. Those taller than 170cm would find the head room limiting in the rear. There are two child seat anchorage points easily accessed, and the rear seats have a 60-40 split fold. This is a genuine hot hatch. It has a shapely and alluring rear end, and a refined crease which extends up from the front door to the rear. Front, rear and side aprons all have red highlights, but the best addition is the diamond grille which proudly shows off the three-pointed star. It's classy yet with a sporting bent. The good stuff: Brilliant performance, smooth and refined ride, great styling inside and out. What we'd like to see: Capped price servicing, foldable colour screen. Warranty and servicing: Three years, unlimited kilometres warranty. Servicing is annually or every 25,000km. 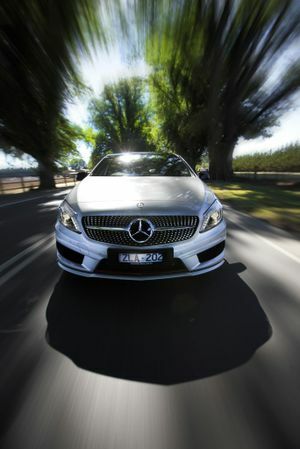 Outstanding to drive and a great looker, this is an outstanding car from Mercedes-Benz. Widespread appeal is the trump-card of the A 250 Sport. Those who feel too old to buy hot hatches like a Golf GTI or a Renault RS would feel comfortable in this athletic Benz - while young buyers too would be proud to have a star on the grille. It's not outlandish in styling, but there are some great touches like red seat belts and the diamond grille which makes it known this is no boring Mercedes-Benz. Model: Mercedes-Benz A 250 Sport. Engine: 2.0-litre turbocharged four-cylinder petrol generating maximum power of 155kW @ 5500rpm (165kW for 30 seconds with overboost function) and peak torque of 350Nm @ 1200-4000rpm. Transmission: Seven-speed dual clutch automatic. Performance: 0-100kmh in 6.6 seconds. Bottom line: $49,900 plus on-roads. The Mercedes-Benz A 250 Sport interior.